This report’s Dishonorable Mentions generally comprise singularly unsound court decisions, abusive practices, legislation or other actions that erode the fairness of a state’s civil justice system and aren’t otherwise detailed in other sections of the report. Responding to inquiries from a federal appeals court, the Connecticut Supreme Court in August 2017 declared that state law supports a $41.7 million jury award in a negligence case against a private school a er a teenaged student was bitten by a tick while hiking in a mountainous area during a study program in China. She later developed a debilitating condition expected to worsen with age. The U.S. Second Circuit Court of Appeals, where the case is now pending, referred two questions to Connecticut’s high court, asking: Are schools obligated by Connecticut policy and law to warn of the danger of contracting an insect-borne illness on eld trips? And was a $41.7 million verdict excessive? The original 2013 jury verdict awarded the student and her family $10.25 million in economic damages and $31.5 million for pain and suffering. 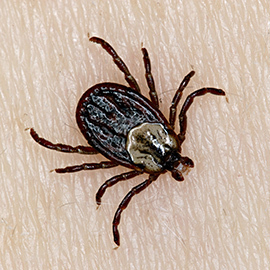 Lawyers for the school continue to argue that there was no duty to warn against contracting a catastrophic tick-borne disease because such an event could not have been foreseen. While observers can understand a jury’s inclination to see that a tragically injured young person’s continuing needs for care are met, one can only wonder if Connecticut’s Supreme Court would have been so magnanimously quick to bless such a giant award had the defendant been a public school funded by Constitution State taxpayers. In 2016 Minnesota voters indicated they were tired of politics as usual in the state legislature and elected a reform-minded pro-business majority for only the second time since the early 1970s. It was an opportunity for lawsuit reform advocates in the state to get serious consideration for many common sense legislative initiatives long stalled in the state. But there was a problem: Gov. Mark Dayton, a loyal servant of the reliably generous plaintiffs’ bar. Trespasser Liability. In 2017 Minnesota lawmakers passed a bill on a bi-partisan basis that would have simply codified in statutory law Minnesota’s common law protection for landowners against trespassers’ liability claims, with certain long recognized exceptions. 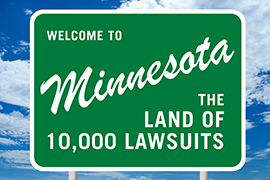 The so-called Trespasser Liability Act had already been passed by all four of Minnesota’s surrounding states in response to the recently activist American Law Institute’s Third Restatement of Torts, which effectively urged courts to impose new liability on property owners for injuries incurred by unwanted trespassers. The Minnesota bill carried bipartisan authors and had the strong support of leading property rights and agri- culture groups. But despite the rare legislative bipartisanship behind the bill’s easy passage, Gov. Dayton vetoed the bill, becoming the only governor in America to veto such a bill since the ALI’s restatement. More than half the states have now enacted such laws. Prejudgment Interest. Gov. Dayton in 2017 also vetoed an omnibus budget bill that included a lowering of Minnesota’s excessively high prejudgment interest rate that helps trial lawyers bully defendants into lucrative pre- trial settlements. Seat Belt Rule. The same omnibus bill vetoed by the governor also contained a provision repealing the state’s Seat Belt Gag Rule. Since 1963 juries in Minnesota have been kept from knowing whether a person injured in a car accident may have contributed to their own injuries by not wearing a seat belt. The gag rule was initially passed when seat belts were relatively new and their capacity to protect drivers and passengers was not yet known. In any case, tort reform efforts in the “Land of 10,000 Lawsuits” may soon enough get a boost as Gov. Dayton has announced he’ll not seek re-election in 2018. Amen. In July 2017 the Wisconsin Court of Appeals, District 1 struck down the state’s statutory limit on noneconomic damages in medical liability cases, holding that lawmakers’ $750,000 limit was arbitrary and unfairly burdensome to catastrophically injured plaintiffs. The appellate court’s decision in Mayo v. Wisconsin Injured Patients and Families Comp. Fund cited the Wisconsin Supreme Court decision in Ferdon ex rel. Petrucelli v. Wisconsin Patients Comp. Fund, which struck down other statutory liability limits largely on equal protection grounds. Both cases also reached the conclusion that the amount of the cap was arbitrarily selected because it was not rationally related to the legislative objective of lowering medical malpractice insurance premiums. Wisconsin’s high court has granted cert and is expected to hear Mayo arguments in early 2018.